Learn about Buffalo, Wyoming by reading Buffalo, Wyoming--Old West, Modern Comforts by Charlie Spence, Travel Writer. It features a mini, but thorough tour of the destination, plus all you'll need to know to plan your trip including getting there, objective information on places to stay and eat, and things to do. At the end of the article, we've provided a summary of the contact information for your easy reference. Enjoy! Lakes and mountains combine for breathtaking scenery in Buffalo. One of the exciting elements of travel is to discover places off the beaten track where there are interesting sights and events not enjoyed by the ordinary vacationer, who time after time returns to a favorite location. One such place to discover is Buffalo, Wyoming, tucked between the rolling plains of the Old West and the towering peaks of the Big Horn Mountains. Buffalo is a place to visit any time of the year depending on your likes and desires. 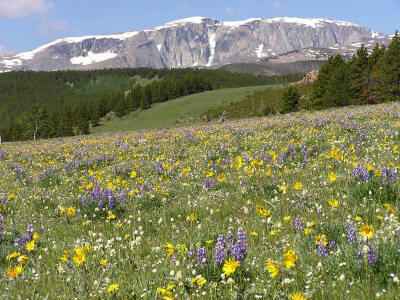 There is skiing in the winter, rodeos in the summer, horseback riding over forest trails with colorful leaves in the autumn, and wildflower viewing in the late spring. Buffalo is rich in the history of the Old West. Nearby, see the "Hole in the Wall" where Butch Cassidy and the Sundance Kid hid out after their outlaw exploits. Buffalo is in Johnson County, where sheep herders and cattle barons, renegades and rustlers were active. It is the county where the Johnson County Range War occurred in the 1880s, an event which many historians consider one of the most notorious events in the history of the United States. At one of the guest ranches, you can see the bullet holes in the barn that were made during one skirmish in that war. Taking in a rodeo is just one of the fascinating things to do in Buffalo. 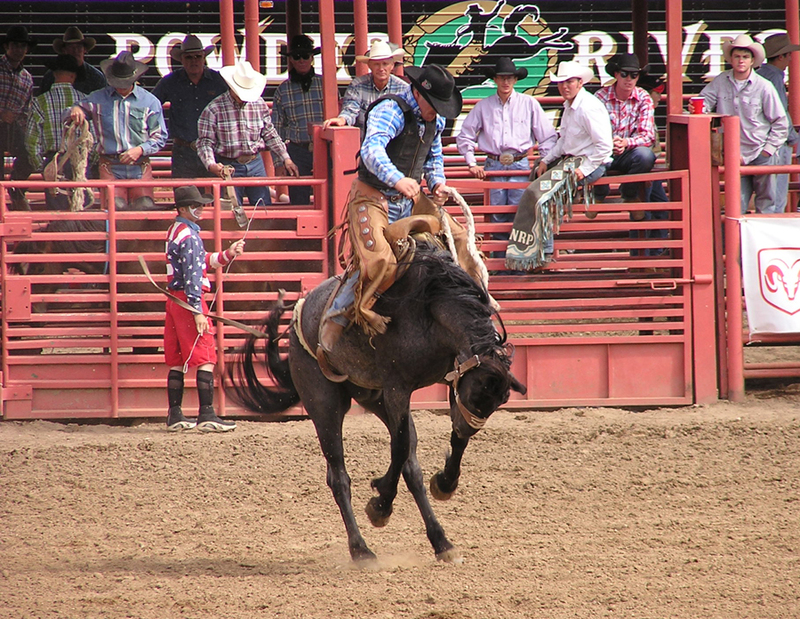 The county has many ranches now where talented cowboys and cowgirls show their skills in the rodeos that occur throughout the spring and summer. They will also help you discover the way of ranch living if you choose to seek the accommodations of a guest ranch. There are about a half dozen guest ranches in the area where you can live like a cowboy and pitch in on the chores. Walk down Buffalo’s Main Street and you will see more than a dozen historic buildings. One of the first spots is the Occidental Hotel, made famous by Owen Wister in his novel "The Virginian." This is where the Virginian "finally got his man." The hotel, the Johnson County Courthouse, and the Carnegie Wing of the Jim Gatchell Museum of the West are all listed in the National Register of Historic Places. Main Street developed from the trail that saw horses, wagons and the first freight wagon trains, with their oxen teams, curve down a slight hill, cross Clear Creek and climb the slight grade on the other side. The town’s first buildings were constructed along this portion of the trail. Clear Creek still bisects the town. The bridge was once written up in Ripley’s Believe-It-or-Not as the only bridge in the world where a U-turn was legal. (That law has since been changed.) If you feel like seeing nature’s beauty up close, there is an eleven-mile walking trail that meanders alongside Clear Creek. Shops along the Main Street offer a variety of goods including many with items reminiscent of the early days of the west. Drop in to the old-fashioned "soda fountain" and get an ice cream treat or maybe walk out with an ice cream cone to enjoy while continuing your tour. While walking along Main Street, stop on the bridge, look down and you will probably see trout swimming in the creek. And if this makes you itch for a good fishing time, the lakes and streams in the area offer what some have called the best fishing spots in the west. You can strike out on your own to one of the streams, take a rowboat on one of the lakes, or see one of the several outfitters in the area who can show you the best fly-fishing spots. 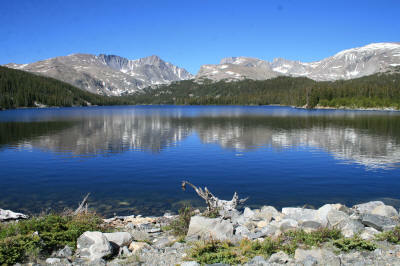 There are more than 200 lakes in the nearby Big Horn Mountains, which are also perfect for canoeing or kayaking. Fishing is but one of the many activities available for people who love the outdoors. Winter visitors may enjoy cross-country ski trails, downhill skiing, or snowmobiling. Nordic skiers or snowshoers can venture over other areas. If you love wildlife, by all means bring your camera. You may be able to capture sightings of elk, deer, and moose, as this area is their summer feeding grounds. Trails in the area offer spectacular scenery, which can be taken in through short hikes, backpacking or even horseback riding. The area around Buffalo was the site of much of what we think of as the Old West and the struggles those pioneers faced. You will want to visit some of the sites to soak up feelings of the frontier days. More than the Johnson County Range War happened here. Some of the most famous Indian battles in American history occurred here and you can visit the sites and also see some of the pre-historic cave paintings by Native Americans. Just a short drive out of town, visit the Fort Phil Kearny State Historic Site. This former fort of the Old West holds much historic lore. Let the surroundings at the fort take you to the days of winning the west. Another place to visit just a short drive away is the monument that marks the spot of the Fetterman Massacre, where Captain W. J. Fetterman and his company disobeyed orders not to engage the Sioux and were lured into a trap where they were massacred by 2,000 warriors in 1866. So, too, is the Wagon Box Fight site monument, which commemorates the 1867 engagement, during Red Cloud's War between the U.S. Army and Lakota (Sioux) Native Americans. Just east of Buffalo is a nature trail that will take you back about 60 million years—the Petrified Tree Forest. Okay, so you want a break from soaking up western ranch living, historic places where the west was won and unbelievable beauty of nature, then take in some of the other pleasure spots of the Buffalo area. There’s a fine 18-hole golf course, where you will find its many changes in elevations make it challenging for all levels of players. For yourself or the youngsters, there is Bozeman Trail Crossing with an old fashioned carousel, Ferris wheel, putt-putt golf, ice cream parlor and family fun. Here is a place where you can combine a tour of some of nature’s best and most alluring beauty with the fascination and fun of checking out how life was in winning the Old West. Buffalo is about half way between Yosemite and Yellowstone National Parks, an excellent place to stop and stretch your legs if you are driving. Interstate highways I-29 and I-90 cross just outside of town. Sheridan, Wyoming, is the nearest city with commercial air service. It is 33 miles from Buffalo. You have a fine choice of places to stay and dine in the Buffalo area. There are more than a dozen motels, B&Bs, hotel and ranches. Also, there are two nearby mountain resorts. Facilities at the ranches range from cabins to rooms and from cowboy living to spas and fine dining. You can check rates and book your room and rental car at WTA’s Online Travel Booking Service . Significant discounts may apply. Speaking of dining, you will find choices from fast food to excellent restaurants. One place be sure to enjoy is the Virginian Restaurant in the Occidental Hotel, named, naturally, for the novel. For hearty eating, order up the western beef and the bison steaks at any one of many restaurants. Notice: This information is current as of July 2008. It is recommended that you contact the numbers, and/or visit the websites above to determine any changes to the information.